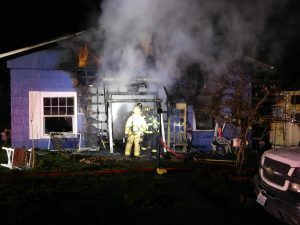 A structure fire in Shelton sent one person to the hospital Friday morning. Firefighters from Central Mason Fire & EMS responded to the 400 block of Henry Street about 5:45 AM. The injured individual was flown to Harborview Medical Center in Seattle. Cause of the fire is under investigation. Shelton Police and neighboring fire districts assisted with the fire.